Jordan Scott is the author of Silt (2005), and from Coach House Books: blert (2008), Decomp (2013, a collaboration with Stephen Collis and the ecosphere of British Columbia), and Night & Ox (2016). His chapbooks include Clearance Process (SMALL CAPS, 2016) and Lanterns at Guantánamo (Simon Fraser University). Both chapbooks treat his experience after being allowed access to Guantanamo Bay in April 2015. Jordan is also the author of the chapbook Dawn published by Tinfish Press of Hawaii (2017). He has been featured at international literary festivals such as Days of Poetry and Wine in Slovenia, and the Oslo International Poetry Festival in Norway. Scott was the 2015/16 Writer-in-Residence at Simon Fraser University. This bundle includes Jordan Scott's essay on prisoner artwork at Guantanamo Bay; a vinyl recording insert of Scott's ambient recordings of Gitmo, produced by Jason Starnes; and a chapbook anthology co-curated by Scott and The Capilano Review, featuring Jordan Abel, Rae Armantrout, Juliane Okot Bitek, Anne Boyer, CA Conrad, Mercedes Eng, Jasmine Gibson, and Cecily Nicholson. In April 2015, Jordan Scott was granted access to the Guantánamo Bay Detention Center, a visit which lasted five days. At Guantánamo he was allowed to take photographs and notes, as well as capture field recordings, while under constant supervision. His attention focused on the facility’s library, collection of inmate art, and surrounding landscape. All Scott's material was subject to military censorship during daily Operational Security meetings except for his poetry and field recordings which were of no interest. 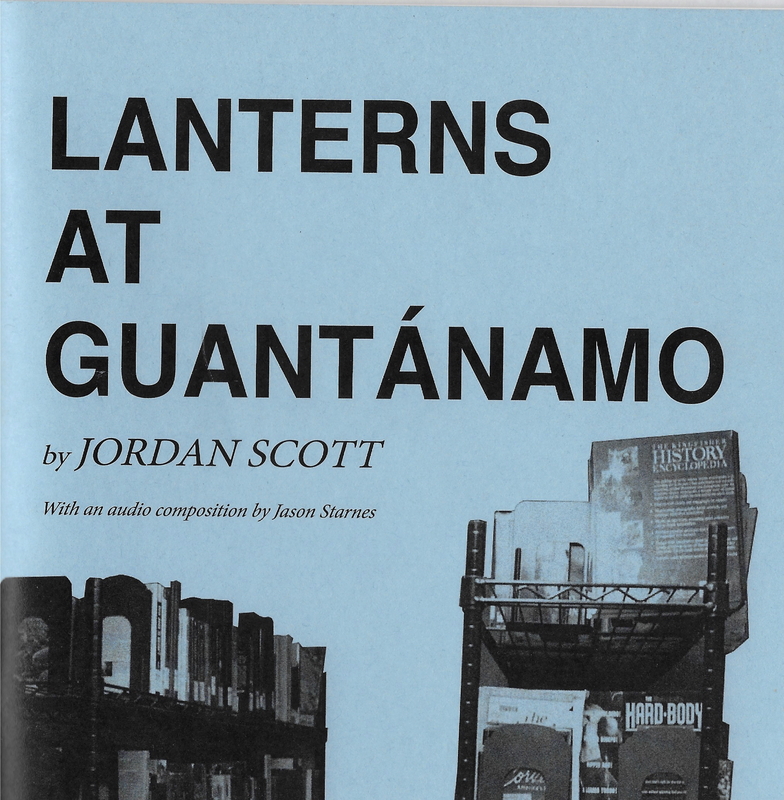 In addition to discussing paintings located in the detainee art gallery at Guantánamo Bay, and his engagement with the directionality of light and the ethics of witnessing, Lanterns at Guantánamo, also explores connections between redaction and ambient sound; between the act of listening and the act of writing; and between, interrogation, and dysfluency, to examine the possibility of listening to redaction. Is it possible to access or listen to a system of state-produced and-induced dysfluency, silence, and absence? "After conducting a yearlong clearance review, the United States Southern Command (USSOUTH-COM) granted me permission in April 2015 to visit Guantanamo Bay as part of a so-called Media Tour. I had applied as a poet researching dysfluency. I provided numerous documents and references and agreed to several background checks, and final approval arrived as a signed "Country Clearance Form." I booked a round-trip ticket from Fort Lauderdale, Florida, the only airport with service to Guantanamo, on a flight operated by IBC Airways ("Your Gateway to the Caribbean"). "I went to Gitmo to investigate correlations between stuttering, dysfluency, and lying. Dys- is a Greek prefix indicating "bad, difficult," or "destroying the good sense of a word, or increasing its bad sense" (OED). Unlike dis-, dys- is not a simple negation; it also signals trangression. Something has gone wrong, in the moral sense. To align the process of recording at Gitmo with dysfluency recognizes the recording process as not only performing a lack, but also transgressing the entire moral code of fluency."